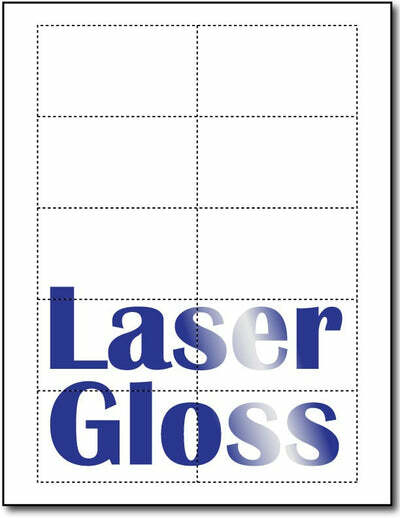 Desktop Publishing Supplies Brand - Our 10 Mil (80lb cover, 216 gsm) Laser Glossy Business Card Paper is only Laser Printer or copier compatible. Our blank laser printer business cards are created with the standard layout and are compatible with all major software. These 10-up business cards are Glossy on one side and matte on the other, and are microperforated and printable on both sides. Our glossy business cards are made from an 8 1/2" x 11", 10 Mil (80lb cover, 216 gsm) white blank Laser Glossy business card stock. Glossy one side only!